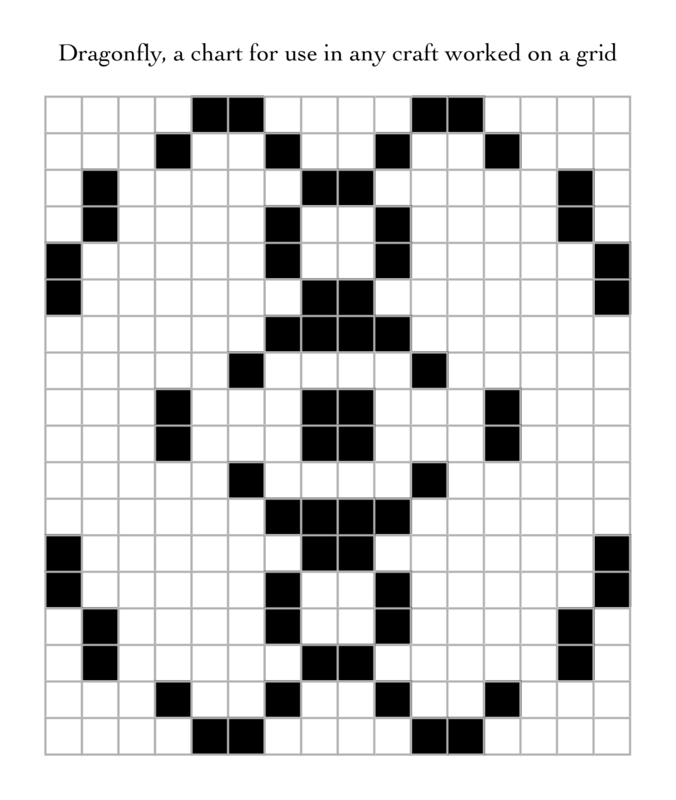 Every month my patrons on Patreon suggest words for me to encode as a knitting stitch and as a more general chart; I choose one at random and publish the results here. The interesting thing about encoding words as knitting stitches is that in most cases it’s hard to say what things like Autumn or Serendipity look like. A word like Dragonfly — an actual physical being with a known appearance — almost seems as if it should be different. But no, the letters still become numbers, and the numbers plotted on a chart still make an arbitrary, abstract design. I’ve also included a chart to use in any craft that uses a grid for layout. These days I generally prefer to separate these out into a separate post to let them be more visible. However, I also prefer to include a separate Monday blog post that’s not based on Patreon suggestions. Two Patreon posts plus a regular Monday post seemed a bit excessive, so. In any case, do scroll down and have a look if you’re not interested in lace knitting. Dragonfly is a multiple of 18+18 stitches and 16 rows. The stitches that are purled (or knit on the wrong side) are optional, except for any (k1, p1) worked into a double yarnover. They help delineate the mini-cables, which are also optional. I say optional, though I did include them because I preferred the look. Still, they do complicate matters. The only stitches that need to absolutely stay as they are to preserve the underlying encoding are the yarnovers. 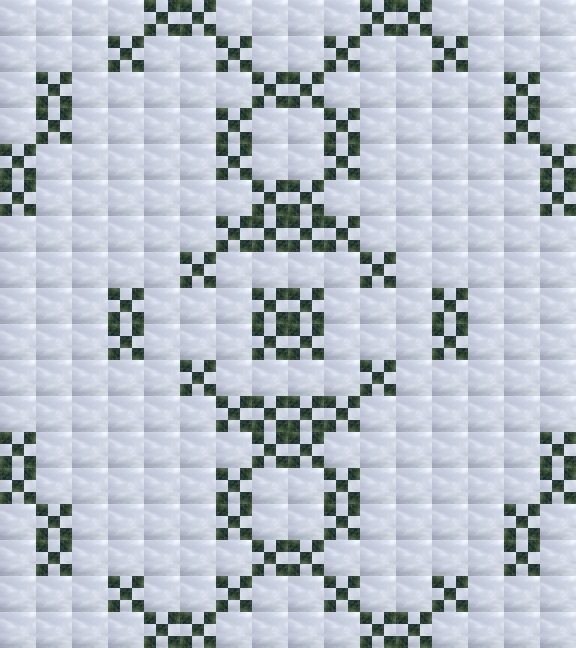 This pattern basically has an 18 stitch repeat. The extra repeat is given in the instructions because of the cable put in on the last row between stitches 18 and 19 when the design is repeated. I’ve made a stitch map for it. A printable PDF is also available. sl2 — k1 — p2sso: slip the next 2 stitches as if to knit 2 together, knit the next stitch, then pass the 2 slipped stitches over the third. Row 1 (RS): yo, k2, ssk, k2tog, yo, k1, k2tog, yo, *yo, ssk, k1, yo, ssk, k2tog, k2, yo x 2, k2, ssk, k2tog, yo, k1, k2tog, yo ; work from *, yo, ssk, k1, yo, ssk, k2tog, k2, yo. Row 2: p8, k1, *(p8, k1) x 2 ; work from *, p9. Row 3: k1, ssk, yo x 2, sl2 — k1 — p2sso, yo x 2, k2tog, k1, *k1, ssk, yo x 2, sl2 — k1 — p2sso, yo x 2, k2tog, k2, ssk, yo x 2, sl2 — k1 — p2sso, yo x 2, k2tog, k1 ; work from *, k1, ssk, yo x 2, sl2 — k1 — p2sso, yo x 2, k2tog, k1. Row 4: (p2, k1) x 2, p3, *(p2, k1) x 2, p5, k1, p2, k1, p3 ; work from *, (p2, k1) x 2, p3. Row 5: 1/1 RPC, p2, ssk, yo, k1, yo, ssk, *k2tog, yo, k1, yo, k2tog, p2, 1/1 LPC, 1/1 RPC, p2, ssk, yo, k1, yo, ssk ; work from *, k2tog, yo, k1, yo, k2tog, p2, 1/1 LPC. Row 6: p1, k3, p5, *p5, k3, p2, k3, p5 ; work from *, p5, k3, p1. Row 7: k1, p2, 1/1 RPC, (k2tog, yo) x 2, *(yo, ssk) x 2, 1/1 LPC, p2, 1/1 RC, p2, 1/1 RPC, (k2tog, yo) x 2 ; work from *, (yo, ssk) x 2, 1/1 LPC, p2, k1. Row 8: p1, k2, p1, k1, p3, k1, *p4, k1, p1, k2, p2, k2, p1, k1, p3, k1 ; work from *, p4, k1, p1, k2, p1. Row 9: 1/1 LPC, 1/1 RPC, p1, ssk, yo x 2, ssk, *k2tog, yo x 2, k2tog, p1, (1/1 LPC, 1/1 RPC) x 2, p1, ssk, yo x 2, ssk ; work from *, k2tog, yo x 2, k2tog, p1, 1/1 LPC, 1/1 RPC. Row 10: k1, p2, k2, p1, k1, p2, *p4, (k2, p2) x 2, k2, p1, k1, p2 ; work from *, p1, k1, p2, k2, p2, k1. Row 11: p1, 1/1 LPC, p1, k2tog, yo, k1, yo, k2tog, *ssk, yo, k1, yo, ssk, p1, 1/1 RPC, p2, 1/1 LPC, p1, k2tog, yo, k1, yo, k2tog ; work from *, ssk, yo, k1, yo, ssk, p1, 1/1 RPC, p1. Row 12: k2, p1, k1, p5, *p5, k1, p1, k4, p1, k1, p5 ; work from *, p5, k1, p1, k2. Row 13: p2, ssk, yo, ssk, k2, yo, k1, *k1, yo, k2, k2tog, yo, k2tog, p4, ssk, yo, ssk, k2, yo, k1 ; work from *, k1, yo, k2, k2tog, yo, k2tog, p2. Row 14: k2, p7, *p7, k4, p7 ; work from *, p7, k2. Row 15: k1, yo, k2tog, k5, *1/1 RC, k5, ssk, yo, 1/1 RC, yo, k2tog, k5 ; work from *, 1/1 RC, k5, ssk, yo, k1. PS. And now that I look again, I see a dragon’s head in the cables. But it’s pure coincidence, really. And still not a dragonfly. Dragonfly stitch patterns by Naomi Parkhurst are licensed under a Creative Commons Attribution 4.0 International License.